Posture is the position of your body while lying down, sitting or standing. Good posture (neutral spine) has numerous health benefits, which includes injury back pain avoidance. • Decreased abnormal joint wear. • Conserve energy as your muscles are used more efficiently. • Prevent muscle strain, overuse plus pain. • Reduce stress on your ligaments, minimising the risk of injury. • Maintain correct alignment of your bones and joints. Poor posture may cause poor digestion, respiratory issues, fatigue, back pain, soreness, headaches plus tension by putting pressure on the spine. In most cases, you can prevent this with the correct education and adjustment as well as awareness of the issue. The team at Spine Scan Chiropractic in Scarbrough and Mount Pleasant in Perth can assist in education and adjustment of poor posture, contact them today. 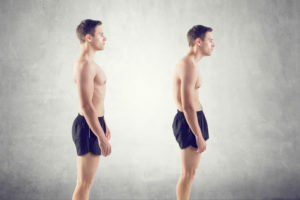 There are a lot of indicators of poor posture; some of the common ones include arched lower back, forward head carriage, rounded upper back, rounded shoulders and hunched shoulders. Back pain is also another indicator. • Visit your local Perth chiropractor, Dr Adam Rocchi at Spine Scan where fast pain relief through the Trigenics Neurological treatment system is offered. • Move regularly; you can start by walking. • Be mindful of how you’re performing everyday tasks, such as picking up the children to gardening, do not put undue stress on your back and neck. • If you’ve a desk job, you should have an ergonomic assessment; it’s important in helping to maintain the health of your spine. • Exercise on a regular basis – Strengthen your muscles and stretch the tight ones to bring your inner athlete back. • When standing, you should balance your body weight equally on your two legs and feet. • You should not sit for a long period; stand and stretch regularly or take brief walks. • Avoid ‘forward head’ posture. You should keep your cheekbones plus collarbone in line. • Keep your shoulders pulled back and down, stomach pulled in, head held high and chin tucked in. A chiropractor helps to improve your posture using treatment specific to the issues they have identified. The team at Spine Scan Chiropractic have many techniques, which include trigenics, soft tissue work, adjustments as well as rehabilitation and specific exercises that you can do at home and in the clinic to help improve and maintain your posture. Contact the team today to discuss treatment options for poor posture. This involves focusing on how the muscles are interacting with the rest of the body to improve posture. When one of your muscles change, another muscle has to change too and compensate for it. Therefore, if one muscle in your body gets weak and underused, then another muscle should become tight and overactive, making up for it. Spine Scan Chiropractic addresses those overactive tight muscles through stretches and specific muscle releases prior to working on making your underactive muscles strong through rehabilitation and exercise. They also prescribe specific exercise and rehabilitation depending on the postural changes in order to reduce tension in the muscles and gradually increase strength in the weak muscles. Spine Scan Chiropractic uses gentle joint movements to ensure you have the best posture correction. The joint movements help in increasing the motion in your joint and decreasing tension in the muscles that are surrounding. If you are in pain and looking for a chiropractor in Applecross, Mt Pleasant or Scarborough in Perth to help you relieve neck pain, back pain, sciatica, shoulder problems or headaches, you should visit Spine Scan Chiropractic.